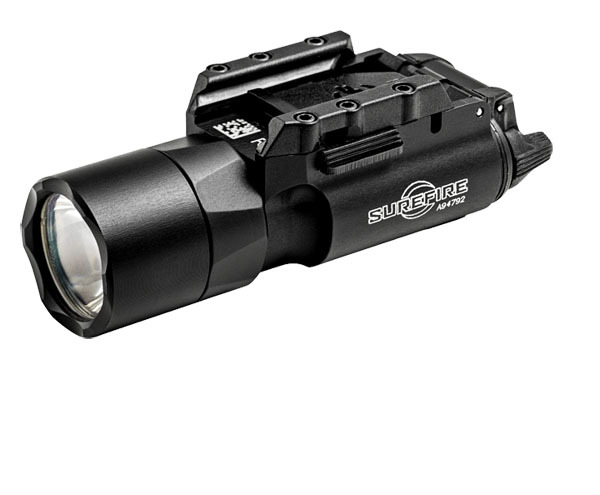 Powerful and versatile, the Surefire X300 Ultra Weaponlight generates 500 lumens of stunning white light focused by a Total Internal Reflection (TIR) lens to produce a tight beam with extended reach and significant surround light for peripheral vision. An ambidextrous rocker control provides one finger activation of the X300 in either momentary or continuous mode. Optional DG grip switches (for pistols) and a pressure activated XT07 tape switch (for long guns) permit the X300 Ultra to be activated without altering your grip on your weapon. Mounts easily to any handgun or long gun picatinny rail system. Battery life of 1.5hrs. Black.